Last Wednesday morning was all rain and road spray. YachtAndBoat.com.au owner, Ben Gaze, was driving into the Sydney Harbour Tunnel, north bound, after a working breakfast. Approximately 150m into the tunnel, he suddenly saw a very small kitten cowering against bare concrete, millimetres from moving wheels. As soon as safety allowed, he rang the Harbour Tunnel Office. After checking the cameras, an RTA vehicle was sent in. But the driver was unable to locate the tiny kitten. Finally, Lesley Morgan from the Sydney Harbour Tunnel with two colleagues and a support vehicle entered the tunnel, closed the nearside lane. The kitten was not so willing to be rescued. There were tense moments of run and chase near busy traffic until the reverse signal from the support vehicle gave just-enough distraction. The caught kitten was unharmed after several hours of tunnel terror, almost a miracle. 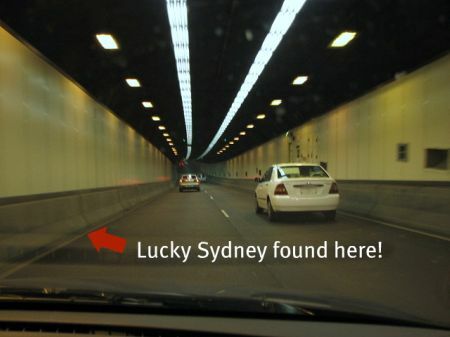 The busy underground Sydney Harbour road is 2.3 kilometres long and sees an average of 86,000 vehicles a day. He now lives on the waterfront in Newport and is enjoying his new position as the official Yacht and Boat “Ship’s Cat”. He has been named “Lucky Sydney”. Lucky’s tunnel adventure and how it began, remains a mystery.